From the Division of Clinical Pathophysiology (I.C.-R., B.W., F.F. ), Department of Anaesthesiology, Pain Centre (M.R.S. ), and Nerve-Muscle Unit, Neurology Service, Department of Clinical Neurosciences (T.K. ), Lausanne University Hospital (CHUV), University of Lausanne, Switzerland. Objective To evaluate the area of the vascular flare in familial amyloid polyneuropathy (FAP). Methods Healthy controls and patients with genetically confirmed FAP were prospectively examined, on the upper and lower limbs, for thermal sensitivity (Medoc TSA-II thermal analyzer) and for axon reflex-mediated flare. The latter was induced by iontophoresis of histamine on the forearm and leg on 2 different visits. We used laser Doppler imaging (LDI) to measure the flare area (LDIflare). Results Six patients had FAP of variable severity; 1 had generalized analgesia secondary to leprosy (used as a positive control). The median Neurological Impairment Score–Lower Limbs (NIS-LLs) was 6 (0–27). The warmth detection thresholds in the feet were higher in patients (median 43°, interquartile range 39.0°–47.6°) compared with controls (37.4°, 35.3°–39.2°), indicating small fiber impairment. On the leg, LDIflare was smaller in the patients on 2 consecutive visits (controls: median 13.0 and 13.3 cm2, IQR 9.7–22.8 and 8.3–16.9; patients 6.9 and 8.0 cm2, 2.6–10.8 and 6.4–12.1; p = 0.011). LDIflare on the leg was correlated with NIS-LL (Spearman rank correlation 0.73, p = 0.09 on the first visit; Spearman rank correlation 0.85, p = 0.03 on the second visit). Conclusions Our study underscores that histamine-induced axon reflex–mediated vascular flare on the leg is reduced in proportion to disease severity in patients with FAP. Our aims were to establish (1) whether the surface area of neurogenic flare triggered by a standard stimulus could be reliably and reproducibly measured by LDI in healthy controls and patients with TTR-FAP, (2) whether this method could discriminate between the 2 groups of participants, and (3) whether the surface area of the flare in patients was reduced in proportion to TTR-FAP disease severity. This project was approved by the Swiss Ethics Committee on research involving humans. All participants provided written informed consent. Seven patients and 10 healthy controls were recruited prospectively for this study between spring and fall 2015. All controls were examined to ascertain their good health status including absence of skin disorders. The included patients underwent standard electrophysiologic recordings of median, sural, and fibular nerve conduction on both sides. Nerve conduction studies were considered abnormal if either nerve conduction velocity or amplitude of the sensory nerve action potentials or compound motor action potentials were abnormal (normal values from our department were used). Thermotesting was performed in a temperature-controlled room using a warm and cold perception threshold TSA-II NeuroSensory Analyzer (Medoc Advanced Medical Systems, Durham, NC). The established method of limits algorithm as reported from the German Research Network on Neuropathic Pain was also used.10 In short, a thermode of 9 cm2 was attached to the skin over the dorsum of the hand and foot bilaterally, and temperature ramps of 1°C/s were applied starting from 32°C. Participants were asked to press a button when they felt a cold or warm sensation. The investigator memorized instructions so that she could present them in a uniform fashion to each participant. LDI was used to quantitate the flare response induced by the iontophoresis of histamine (LDIflare). This response is neurologically mediated as it is blocked by surface anesthesia, as previously shown,13 and verified by us in preliminary experiments in healthy controls (data not shown). A 3.5 × 4.5 cm zone of skin devoid of visible superficial veins was chosen on the volar face of the forearm, or on the lateral side of the calf, from which a baseline LDI scan was obtained. A ring-shaped chamber made of rubber, with an internal diameter of 0.8 mm fitted with a copper electrode, was then fixed to the center of the zone (using double-sided tape) and filled to the rim with 1% histamine in deionized water. A reference ECG electrode was placed similarly, nearby. Both electrodes were connected to a current source (MIC-1e iontophoresis controller; Moor Instruments). A direct current of either 20 or 100 μA was applied for 60 seconds. As histamine in solution is negatively charged, the iontophoresis chamber was on the positive end of the controller. Once current delivery was terminated, the chamber was removed, the skin dried, and the area directly exposed to the histamine solution was masked with a circular piece of opaque tape. Five consecutive LDI scans of the zone were then acquired at a frequency of one every 2 minutes. For each of them, the spatial extension of SkBF increase (flare area) was determined. The maximal flare area expressed in cm2 was considered as quantification of the axon reflex within the probed skin zone. Each recorded image consisted of approximately 20,000 pixels, each with an attached flux value. Within the post-iontophoresis scans, any pixel whose value exceeded a specific threshold was considered part of the flare area. The chosen threshold was the 99th percentile of all pixel values in the baseline image. Because of its potential confounding effect, surface temperature within the chosen skin zone was systematically recorded with a thermocouple in the minute before iontophoresis. Heat-conducting paste was used to ensure proper thermal contact between the skin and the thermocouple. Each participant was examined during 3 successive visits separated by at least 3 days. Visits 1 and 2 were for recording the histamine flare at various locations, whereas quantitative sensitivity testing (QST) was performed on visit 3. The same investigator (the first author, I.C.-R.) performed all examinations between 8 and 12 am, in a quiet temperature-controlled room (22°C–24°C), with the participant lying comfortably on a hospital bed. On visit 1, 4 pairs of skin zones were chosen, 1 on each forearm and 1 on each calf. Zones within each pair were at least 10 cm apart and were both allocated to receive histamine iontophoresis, with a current intensity of 20 μA on 1 zone and 100 μA on the other. On the upper and lower limbs, treated zones at both intensities were placed as symmetrically as possible and their location recorded on transparent film. A total of 8 histamine flares were thus recorded: 2 intensities on each of the 4 limbs. The order of rotation between limbs and for intensities on limbs was randomized. The whole procedure including setup, acquisition of baseline, iontophoresis, acquisition of post-iontophoresis images required approximately 30 minutes, making for a total visit duration of 4 hours. For each participant, visit 1 protocol was repeated identically on visit 2, so as to assess the intraindividual variability. In particular, the recording zones were repositioned as exactly as possible at the same spot (made possible by the aforementioned recording on transparent film), with intensity allocation and rotation order identical to those of visit 1. Histamine flare and local skin temperature data were evaluated statistically with mixed-model analysis of variance, using the xtmixed procedure in Stata version 12 (Stata Corp LP). Responses obtained at the same iontophoretic current intensity at symmetrical locations were considered as replicates, and data from the upper and lower limbs were analyzed separately. Thus, the model comprised participant group (control or patient), current intensity (20 or 100 μA), visit number (1 or 2), and all 2- and 3-way interactions. In a second step, interactions with p values > 0.1 were removed. The p values reported in the results are from this more parsimonious model. The same general method was used to evaluate each of the 4 outcome measures generated by QST testing (detection and pain thresholds for warm and cold stimulations). In this case, the model was simpler because there was only 1 visit and that stimulus intensity was not a factor. 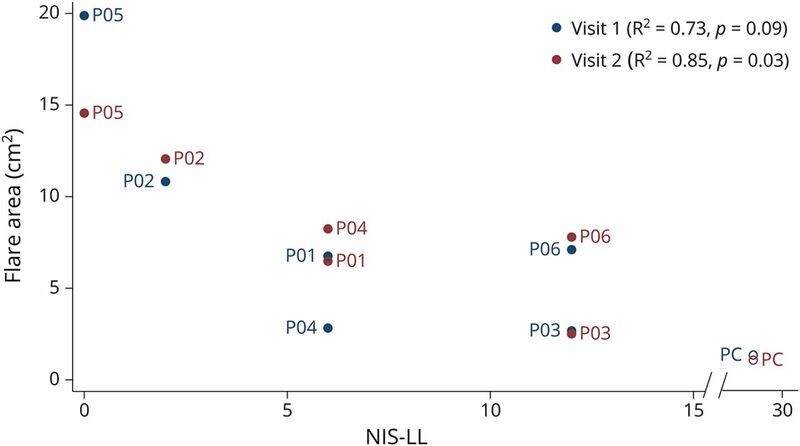 The relationship between histamine flare and clinical severity score (NIS-LL) was assessed with Spearman rank correlation coefficient. 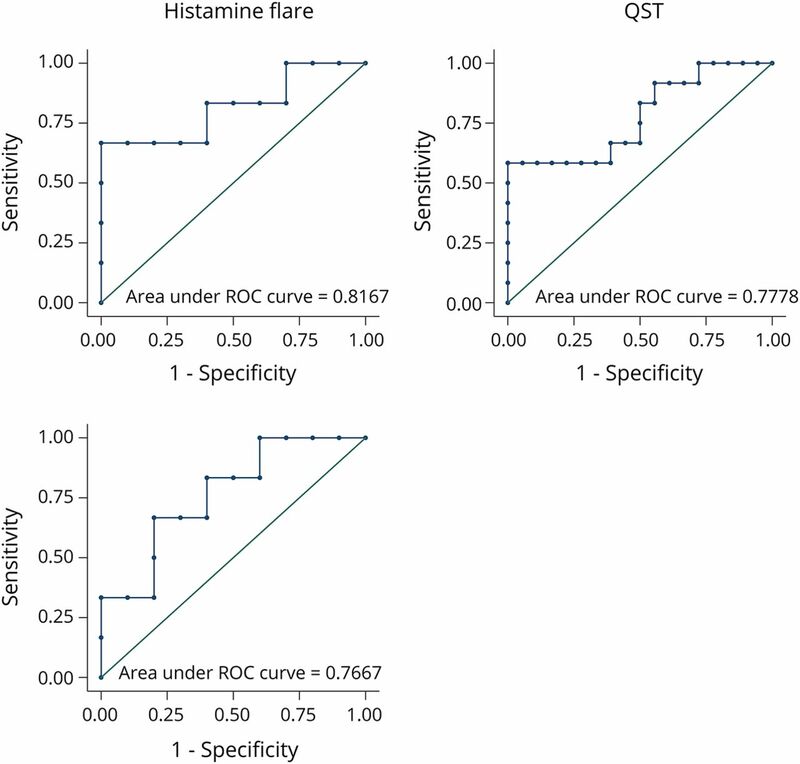 Finally, we compared the ability of histamine flare and QST data to discriminate between groups, using receiver operating characteristic (ROC) curve analysis. Logistic regression was performed with group membership as the outcome variable and either histamine flare at a specific intensity or specific QST responses as predictors (procedure logistic, followed by the lroc command in Stata). The area under the ROC curve (AUC) was calculated. The AUC can range from 0.5 to 1, with the former value indicating no, and the latter, perfect discriminating ability. We recruited 6 patients, all women, with FAP of variable severity (table 1). All had a confirmed mutation in the TTR gene: Val30Met in 5 cases and Glu89Lys in one. As a positive control (table 1), we included a seventh male patient with generalized analgesia secondary to lepromatous leprosy. His individual data indicated below is excluded from all statistical calculations (see Patients' characteristics). By “patient group” (or “patients”), we therefore mean only the 6 patients with FAP. Of the 10 healthy controls, 5 were women and the remaining were men. Their median age was 50 years (range 20–64). For comparison, the median age of the 6 FAP patients was also 50 years (range 37–58). All underwent extensive blood workup and imaging studies and excluded metabolic, immunologic, or infectious causes of small fiber neuropathy, in particular, diabetes, neurodegenerative diseases, and paraneoplastic syndromes. Table 1 contains a detailed description of our patients. Patients were overweight with a median body mass index of 29.4 kg/m2 (range 28.5–31.9) corresponding to the range of the controls (mean 29.8 kg/m2: 27.5–31.7). The median duration of FAP was 12 years. Echocardiography was abnormal in P04 and P06 only. Nerve conduction studies revealed carpal tunnel syndrome in 4 patients (P01, P02, P04, and P06) and reduced or absent sural/fibular nerve potentials in 3 (P01, P03, and P04). Four patients had undergone liver transplantation. Among them, the patient with the GLu89Lys mutation (P04) also had a heart transplant, as published previously.14 Clinical manifestations were scored according to NSS, a well-disseminated score used to quantify symptoms in patients with neuropathies of various causes, and all had neuropathic symptoms; neurologic examination was quantified using scores dedicated to patients with FAP (the so-called NIS-LL). These scores were correlated with clinical FAP severity and with signs of large nerve fiber neuropathy on examination. As it can be deduced from NSS and NIS-LL data, patients P02, P05, and P06 were mildly affected having only a small nerve fiber neuropathy. Patients P01, P03, and P04 had the highest NSS and NIS-LL scores and were the most affected having concomitant small and large nerve fiber neuropathy. These 3 patients had abnormal sensory nerve action potentials. Concerning the clinical staging of the disease, all 6 patients were at stage I of the Clinical Staging of TTR-FAP, a stage used to start therapeutic options in the clinical setting. Patients were heterogeneously distributed according to the PND score (median 1 of 4) or to the Portuguese severity classification of TTR-FAP (median 2 of 6). The patient with leprosy was the most severely affected. Thermotesting results from the hands and feet in the 2 groups are shown in table 2. Patients differed statistically from controls on the hands and on the feet, with respect to detection threshold for both warm and cold. Differences were more marked on the feet, however, indicating length-dependent small fiber impairment in the patients. Figure 1 shows the area of the flare induced by the 2 iontophoretic doses of histamine, measured by LDI on the forearms and legs on visits 1 and 2, for each study participant. Regarding statistical analysis, the only interaction terms that came out marginally significant when fitting the full model was between the group and the iontophoretic dose (p = 0.07, below the predefined level of 0.1, see Methods). Therefore, the statistical results reported here are from a model comprising simple main effects and this specific interaction. 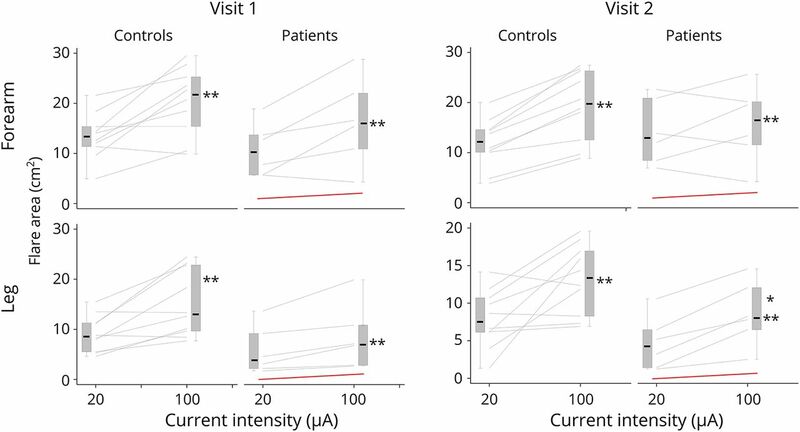 The dose-response effect was clearly visible and statistically highly significant on both visits (p < 0.001). On the forearm, the histamine flare area did not differ, at either dose, between the 2 groups (p = 0.30). By contrast, on the leg, this response was less intense in patients, at least for the higher dose of histamine, on both visit 1 (controls: median 13.0 cm2, interquartile range [IQR] 9.7–22.8; patients: median 6.9 cm2, IQR 2.6–10.8; p = 0.011 vs controls) and visit 2 (controls: median 13.3 cm2, IQR 8.3–16.9; patients: median 8.0 cm2, IQR 6.4–12.1; p = 0.011). Measurements made on the left and right sides of the same person were considered replicates, averaged and plotted as shown, for each study participant. The box plots indicate the median, interquartile range, and extreme values. *p < 0.05 patients vs controls. **p < 0.01 iontophoretic dose of 100 vs 20 μA. The red line corresponds to the positive control patient (table 1). The measurements of local skin temperature (T_skin) performed before each iontophoresis are detailed in table e-1 (links.lww.com/NXG/A61). On average, T_skin appeared slightly but significantly lower in patients compared with controls. Statistical analysis was repeated while adding this possible confounder to the model with essentially identical results: the dose-response effect remained (p < 0.001); the difference in the flare area between patients and controls was still significant on the leg at a current dose of 100 μA (p = 0.019), but not on the forearm at either dose (p = 0.47). In patients, the area of histamine flare on the leg was inversely correlated with the clinical status, as shown in figure 2. P01, P03, and P04 were the most affected patients, having concomitant small and large nerve fiber neuropathy and abnormal sensory nerve action potentials. This correlation held up whether values for the histamine flare area were taken from visit 1 (Spearman R2 0.73, p = 0.09) or visit 2 (R2 0.85, p = 0.03). Indeed, flare areas on both visits were nearly identical in 4 of the 6 patients, although further apart in the other 2. R2: Spearman rank correlation coefficient. Data points labeled according to the patient ID (table 1). NIS-LL = Neurological Impairment Score–Lower Limbs; PC = positive control. The intraindividual variation in the histamine flare area from visit 1 to visit 2 is shown more completely in figure 3 (which for the sake of brevity only displays data obtained from the highest iontophoretic current dose) in the form of Bland and Altman plots. These plots reveal negligible bias (none of which reached statistical significance), but relatively wide limits of agreement. Data from flares induced with the 100 μA iontophoretic current on the leg. Full horizontal lines: average difference across participants (bias). Dashed lines: limits of agreement. Numerical values for bias and limits of agreement shown on each plot, expressed in cm2. 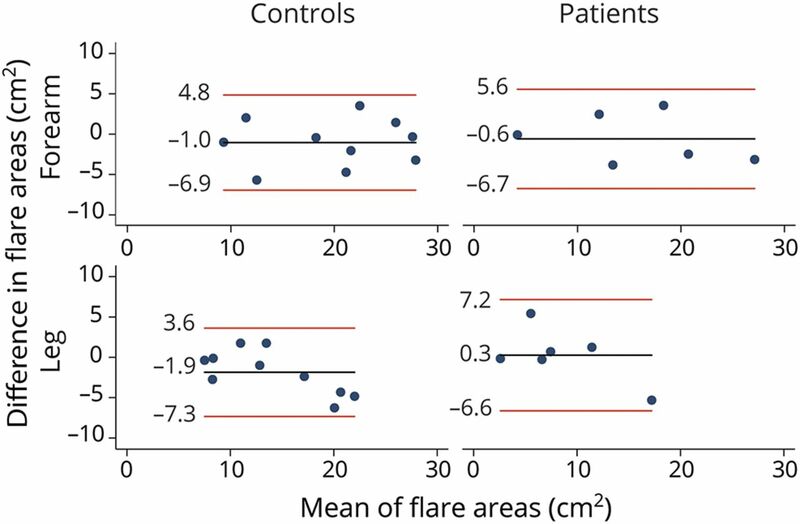 As evaluated from ROC curve analysis (figure 4), the ability of histamine flare to discriminate between patients and controls was similar on visit 1 (AUC 0.81) and visit 2 (0.77). Furthermore, the performances of histamine flare and QST testing were comparable (AUC for QST testing, 0.78). Receiver operating characteristic (ROC) curves derived from logistic regression analysis, with group membership as the dependent variable. Predictors in the model were those on which the groups differed statistically, i.e., histamine flare area on the legs at a current intensity of 100 μA (figure 2) or detection threshold for warm and cold on the hands and feet (table 2). Based on our previous experience in quantifying spatial distribution of SkBF with LDI,12,15,16 we present here the findings from a prospective study comparing LDIflare in patients with FAP and controls. Our results indicate that axon reflex-mediated neurogenic cutaneous vasodilation in response to histamine measured by LDI (1) is easily elicited in both groups of participants, (2) is only moderately reproducible at the intraindividual level, (3) despite this latter limitation appears clearly reduced in patients according to a length-dependent pattern, and (4) shows an ability similar to QST testing for discriminating between patients and controls. Among the tests for small fiber function,3 QST is considered a gold standard tool.1,19 In terms of ability to discriminate between patients and healthy controls, LDIflare has been variously reported as inferior to QST in diabetic neuropathies20 or equivalent in neuropathies of mixed etiologies.21 In keeping with this latter study, ROC curve analysis in our case showed a similar performance of histamine flare and QST (figure 4). The discrepancy between studies could reflect methodological differences. Alternatively, it may be related to different sample sizes and case mix. Our patients had peripheral neuropathies of homogeneous etiology. However, their small number precludes any meaningful calculation of cutoff points for estimating the respective sensitivities and specificities of LDIflare and QST. A larger study is required to that effect, keeping in mind that the ultimate clinical usefulness of these tests would depend on their negative/positive predictive values. The latter, in addition to specificity and sensitivity, are in turn determined by the prevalence of the condition under investigation. An important result of our study is the correlation between the LDIflare area and NIS-LL, a score recently found to be a valid and reliable measure of TTR-FAP severity.17 This a new correlation being up to now only demonstrated by nerve biomarkers obtained from skin biopsies.22 This is valid for our patients independently of clinical small or large nerve fiber involvement or absent/reduced sensory nerve action potentials on nerve conduction studies. The current study has limitations. Considering FAP heterogeneity,1 our small patient sample may not be representative. However, our data provide a rationale for the use of reflex-mediated neurogenic cutaneous vasodilatation in response to histamine in a larger scale. This reflex measured by LDI is an objective and quantitative measure that can potentially serve as a useful biomarker, assessing TTR-FAP severity in epidemiologic surveys and therapeutic trials, even at an early disease stage. I. Calero-Romero: acquisition of data, analysis or interpretation of data, and revision of the manuscript. M. R. Suter: analysis of data and revision of the manuscript. B. Waeber: revision of the manuscript and study supervision. F. Feihl: study concept and design, acquisition of data, study supervision, analysis and interpretation of data, statistical analysis, and drafting and revision of the manuscript. T. Kuntzer: study concept or design, acquisition of data, study supervision, analysis and interpretation of data, and drafting and revision of the manuscript. I. Calero-Romero reports no disclosures. M.R. Suter has served on the scientific advisory boards of Indivior and Pfizer; serves on the editorial board of Revue Médicale Suisse; and has received research support from Pfizer, IASP, and the European Society of Anaesthesiology. B. Waeber and F. Feihl report no disclosures. T. Kuntzer has served on the scientific advisory board of the French Peripheral Society and has received funding for travel/speaker honoraria from CSL Behring. Full disclosure form information provided by the authors is available with the full text of this article at Neurology.org/NG. The authors are grateful to all patients, relatives, and other controls for accepting to participate in the study. They thank Dr. Melanie Price and Dr. Pinelopi Tsouni for critical reading of the manuscript.
. Guideline of transthyretin-related hereditary amyloidosis for clinicians. Orphanet J Rare Dis 2013;8:31.
. Familial amyloid polyneuropathy. Lancet Neurol 2011;10:1086–1097.
. Small-fibre neuropathies–advances in diagnosis, pathophysiology and management. Nat Rev Neurol 2012;8:369–379.
. Neurogenic inflammation and the peripheral nervous system in host defense and immunopathology. Nat Neurosci 2012;15:1063–1067.
. C-fiber axon reflex flare size correlates with epidermal nerve fiber density in human skin biopsies. J Peripher Nerv Syst 2009;14:294–299.
. Laser doppler assessment of vasomotor axon reflex responsiveness to evaluate neurovascular function. Front Neurol 2017;8:370.
. Axon reflex flare and quantitative sudomotor axon reflex contribute in the diagnosis of small fiber neuropathy. Muscle Nerve 2013;47:357–363.
. Quantitating overall neuropathic symptoms, impairments, and outcomes. In: Peripheral Neuropathy, 4th ed: Elsevier; 2005:1031–1051.
. NIS-LL: the primary measurement scale for clinical trial endpoints in diabetic peripheral neuropathy. Eur Neurol 1999;41(suppl 1):8–13.
. Reference data for quantitative sensory testing (QST): refined stratification for age and a novel method for statistical comparison of group data. Pain 2010;151:598–605.
. Local heating of human skin causes hyperemia without mediation by muscarinic cholinergic receptors or prostanoids. J Appl Physiol 2004;97:1781–1786.
. Desensitization of thermal hyperemia in the skin is reproducible. Microcirculation 2012;19:78–85.
. Effect of topically applied local anaesthesia on histamine flare in man measured by laser doppler velocimetry. Agents Actions 1989;28:192–197.
. Successful heart and liver transplantation in a Swiss patient with Glu89Lys transthyretin amyloidosis. Transplantation 2011;91:e40–e42.
. Acute endotoxemia inhibits microvascular nitric oxide-dependent vasodilation in humans. Shock 2011;35:28–34.
. The vasodilatory response of skin microcirculation to local heating is subject to desensitization. Microcirculation 2009;16:265–275.
. The rate of decline in small fibre function assessed using axon reflex-mediated neurogenic vasodilatation and the importance of age related centile values to improve the detection of clinical neuropathy. PLoS One 2013;8:e69920.
. C-fiber function assessed by the laser doppler imager flare technique and acetylcholine iontophoresis. Muscle Nerve 2009;40:985–991.
. The diagnostic criteria for small fibre neuropathy: from symptoms to neuropathology. Brain 2008;131:1912–1925.
. Diabetic neuropathy: a cross-sectional study of the relationships among tests of neurophysiology. Diabetes Care 2010;33:2629–2634.
. Laser doppler flare imaging and quantitative thermal thresholds testing performance in small and mixed fiber neuropathies. PLoS One 2016;11:e0165731.
. Cutaneous nerve biomarkers in transthyretin familial amyloid polyneuropathy. Ann Neurol 2017;82:44–56.